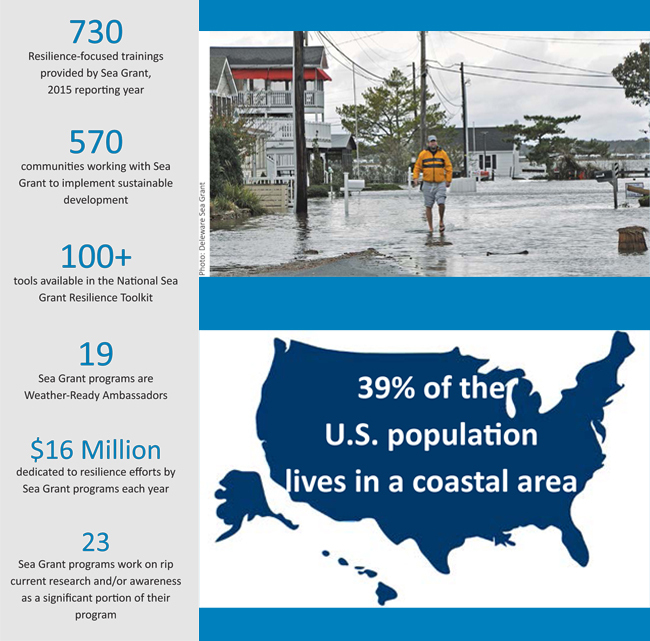 For the Sea Grant network, resilience is more than a buzzword. For 50 years, researchers and outreach specialists have been identifying hazards not only from storms but also from long-term coastal dynamics —geological, ecological and economic, just to name a few. Communities seek Sea Grant expertise to support and sustain diverse and vibrant economies. This includes effectively planning for, responding to and recovering from natural and technological hazards, and finding ways to effectively function within limits of their respective ecosystem. Marinas devastated by Superstorm Sandy were among the massive economic impacts from the coastal storm. New York’s governor asked Sea Grant experts to work alongside agency and business partners on a task force to speed the recovery of the recreational boating industry. So far, marina facilities have received $10 million in grants through the New York Rising Small Business Recovery Program. More via NYSG's related recent impact statement, "NYSG Assists Marinas in Sandy Recovery Efforts" (pdf). New York Sea Grant worked with the Town of East Hampton and a national consulting company to develop a proposal for a demonstration project that will identify and collect the data needed to inform the coastal resiliency planning in the Town. In 2016, NYSG will serve as a technical advisor to the project that received $220,000 in New York State Energy Research and Development Authority Climate Change Adaptation Opportunities Program funding. More via NYSG's related recent impact statement, "NYSG Helps Town of East Hampton with Coastal Resiliency Planning" (pdf). The videos are based on a final report from the National Oceanic and Atmospheric Administration's Coastal Storm Awareness Program (CSAP), a $1.8M effort conducted by Sea Grant programs in New Jersey, New York and Connecticut. Through CSAP, a suite of 10 social science studies were funded to help better understand how people respond to coastal storm warnings. Both the short documentary and accompanying trailer point to resources from NOAA's National Weather Service, the Federal Emergency Management Agency, NYC Office of Emergency Management and more. More on this at www.nyseagrant.org/csap, where, in addition to news and details on each of the 10 funded projects, you'll find the program's final 286 page report (pdf) that these videos are based on. NYSG offers additional resources on severe storms at www.nyseagrant.org/hurricane and www.nyseagrant.org/superstormsandy. Heading to the beach? Avoid rip currents that cause 80 percent of surf-zone rescues. Sea Grant programs from throughout the country, including New York, support the "Break the Grip of the RipTM" campaign, which provides signs and videos to raise awareness about the swim hazard. Partners on this effort include NOAA's National Weather Service, National Ocean Service, U.S. Lifesaving Association and shorefront communities. What is a rip current? It's a powerful, channeled current. We all love the beach in the summer. The sun, the sand, and the surf. But just because we're having fun, doesn't mean we can forget about safety. Get the facts about rip currents in the above video, provided by NOAA Ocean Today. Panicked swimmers often try to counter a rip current by swimming straight back to shore—putting themselves at risk of drowning because of fatigue. While the terms are often confused, rip currents are different than rip tides. A rip tide is a specific type of current associated with the swift movement of tidal water through inlets and the mouths of estuaries, embayments, and harbors. For additional resources, see NYSG's related Web site, www.nyseagrant.org/ripcurrents. Warnings from the National Weather Service now focus on specific potential impacts from an approaching system. The Sea Grant Great Lakes Social Science Network provided key research results to make those warnings easier to understand, including specific actions to take. In the Northeast, Sea Grant engaged Emergency Managers in developing emergency communication plans. It’s all part of being a Weather-Ready Nation. For more on this project, see NYSG's related news items, "Social Science & Severe Weather: Evaluating NOAA's Impact-based Warning Tool" and "Tracking ‘Great Lakes Nor’easters,’ New Eastern Lake Ontario Project." Our "Trending Topics," such as climate change and green tips for coastal living, via a section on our homepage, www.nyseagrant.org. For the latest news from NYSG, check out our 'Currents' section, www.nyseagrant.org/currents, as well as our 'by-topic' archives, www.nyseagrant.org/currentsarchive. To keep tabs on all of NYSG's coastal science news, follow us on Facebook (www.facebook.com/nyseagrant), Twitter (www.twitter.com/nyseagrant) and YouTube (www.youtube.com/nyseagrant); Subscribe to our free news feeds (click the orange & white icon in the "Follow Us" navigation bar at www.nyseagrant.org); Sign up for our e-list in a few quick clicks at www.nyseagrant.org/nycoastlines. Our flagship publication, NY Coastlines / Currents, is published 1-2 times a year.